To combat the unprecedented rhino poaching crisis in Southern Africa, Tintswalo Safari Lodge aims to raise awareness about the poaching epidemic and provide funding and support for a variety of urgently-needed anti-poaching interventions in the Manyeleti Game Reserve, Greater Kruger National Park and the South African Wildlife College (SAWC). 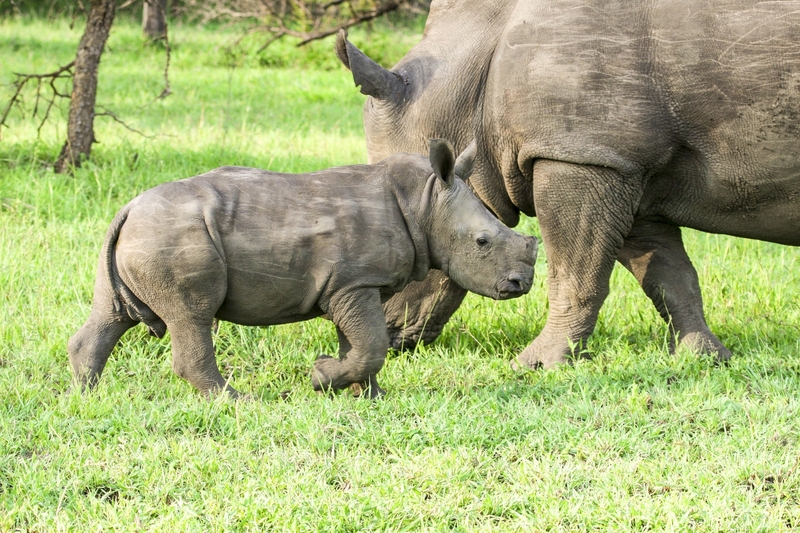 The poaching crisis in Africa is driven by an ever-increasing demand for rhino horn. South Africa has by far the largest population of rhinos in the world and is an incredibly important country for rhino conservation. From 2007-2014 the country experienced an exponential rise in rhino poaching – a growth of over 9,000%. Most illegal activity occurs in Kruger National Park, a 19,485 km2 of protected habitat on South Africa’s north-eastern border with Mozambique. Kruger consistently suffered heavy poaching loses, and so in the last few years the government and international donors have channeled ever more funding and resources into securing the Park. In 2016, figures show a dip in poaching in South Africa for the second year in a row, indicating that increased protection efforts are paying off. Although it is encouraging to see South Africa’s poaching levels fall, the losses are still extremely high. A rise in incidents outside Kruger National Park also points to the growing sophistication of poaching gangs that are gaining a wider geographical coverage and – it would seem – expanding their operations across borders. Poaching syndicates are well-equipped, highly-organised and dangerous – they use helicopters, machine guns, veterinary immobilisation drugs and other sophisticated methods to stalk rhinos and kill them, taking their horn and selling the horn. Creating awareness for the tourists and guests that visit the area and the lodge. Educate and involve the local surrounding communities, specifically children, on the rhino poaching crisis and how they can help if they notice anything in their community. Supporting the funding of anti-rhino poaching projects being run by the SAWC, which include the ‘Eye in the Sky’ Bathawk Programme, Wildlife Guardianship/Anti-Poaching Field Ranger Training and the K9 Anti-Poaching Project. Raise awareness among the international and national guests that visit the lodge, by presenting an informative visual presentation with the facts and figures on rhino poaching, and some ways that the guests can help. Each guest also has the option to donate to our cause on check out. In conjunction with the local communities in the region, private companies and government departments have joined forces to drive an educational awareness program, targeting the local surrounding communities on the borders of the Manyeleti Game Reserve. 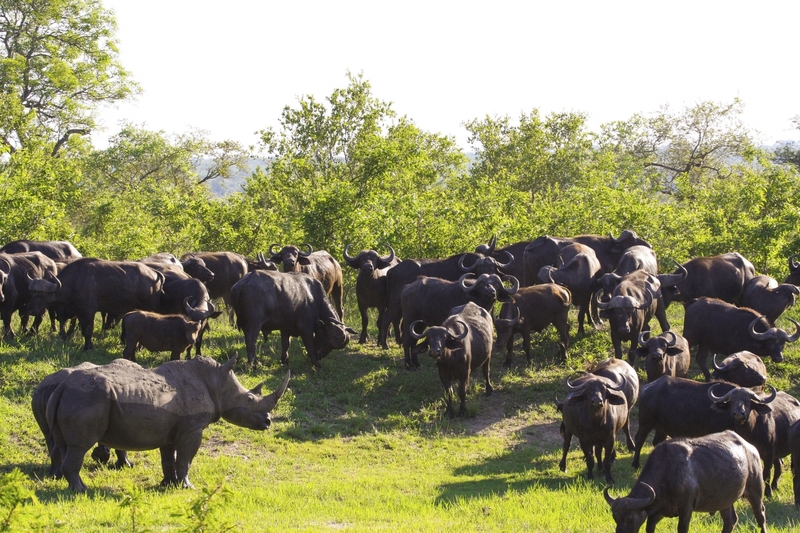 This joint venture is a combination of the following role players including The South African Police Service, Mpumalanga Tourism and Parks Agency, Tintswalo Safari Lodge, Honeyguide Tented Camp and local communities and schools. The aim of this is to develop and educate the youth and communities to protect our natural resources by creating an understanding of the relationship between the game reserve, eco-tourism & lodges, our natural heritage, the community and jobs to have a sustainable future for all. So far this programme has reached roughly 800 pupils from the 19 communities surrounding the Manyeleti. To support the SAWC and the training it conducts to upgrade the skills of people within the conservation sector whilst also playing a vital role in the protection of Africa’s biodiversity. 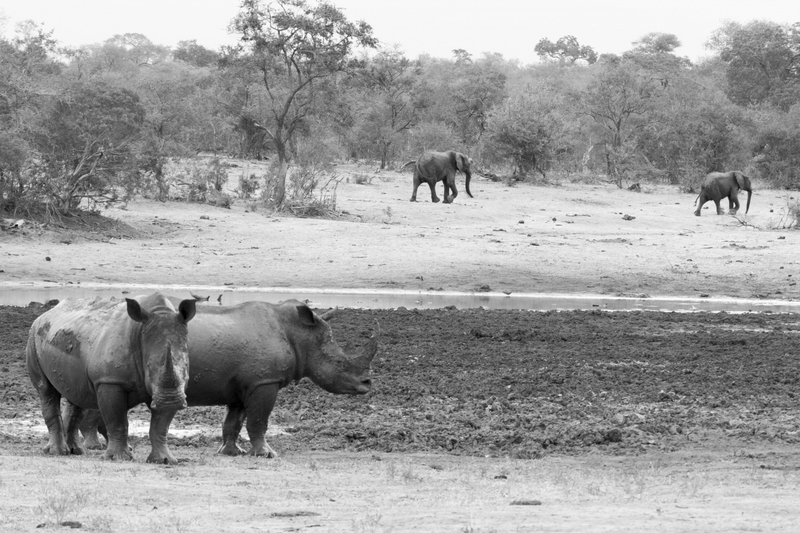 In response to the current rhino poaching crisis in South Africa, a joint proposal between the SAWC and the Game Ranger’s Association of Africa (GRAA) gave rise to the Wildlife Guardian Programme. This programme holds as its main aim the training of field rangers to compete with poachers to ensure the territorial integrity of Protected Areas and in so doing, protect its wildlife and our natural heritage. 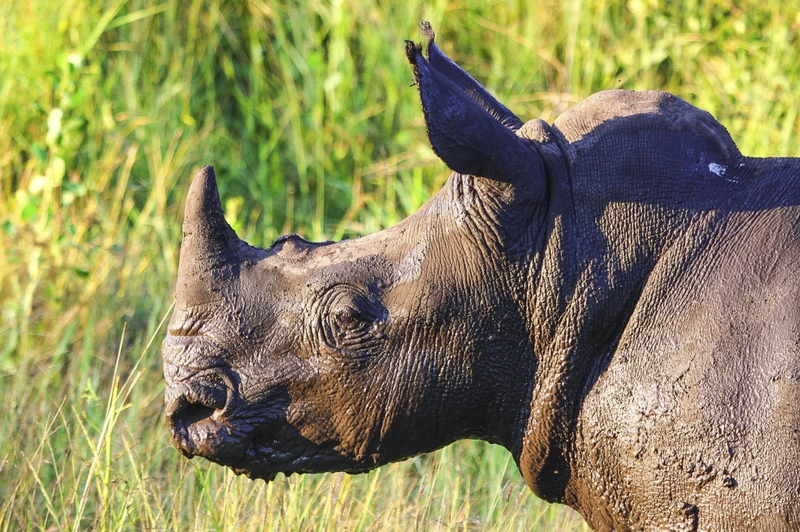 From 2008 – 2015 more than 5,940 African rhinos have been killed for their horns. (Stats – International Union for Conservation of Nature (IUCN) Species Survival Commission’s African Rhino Specialist Group (AfRSG). Despite emergency summits and a public outcry there has been no respite and this massacre continues at an alarming rate. It is estimated that one rhino is being killed in South Africa every 8 hours albeit that there has been an increase in arrests being made. Field rangers are the first and often last line of defense once poachers have entered a conservation area; literally the bullet proof shield for the rhino in some cases. To carry out this function they require dedication, physical fitness and stamina and a high level of skills in a broad range of fields. Your donation will help to ensure that they receive the training and equipment they need to help curb this rhino poaching scourge. Many of our wilderness areas are under the growing threat of increasing population growth, sprawling urbanisation, deepening poverty, encroaching land use, poaching and the unsustainable exploitation of natural resources. It for this reason that an understanding, sensitivity, appreciation, transfer of real benefit and relevant knowledge needs to be communicated through the training process. Unfortunately, the effect of poverty, unemployment, lack of funds to further their studies and boredom among young people has in many instances prompted them to resort to illicit activities such as poaching of both wild animals and plants for their survival. This poses a serious threat to both conservation of biodiversity and human life in general. These illicit activities have resulted in many of these young people being charged and convicted by both the park and/or the local and traditional authorities, with severe fines being a consequence. It is in this context that the SAWC is seeking funding to train and expose young people with the potential, to conservation guardianship skills and aspects of the wildlife industry thereby giving them a much better chance for future employment by communities and / or conservation organizations as field rangers and to ensure the transfer of knowledge once they are trained. With the current rhino poaching crisis ultra-light aircraft, such as the SAWC’s Bathawk and Savannah aircraft are vital in terms of anti-poaching training, ground to air patrols and support in terms of rhino monitoring and data capture. The inclusion of ground-to-air training, using actual helicopters and fixed wing aircraft, has raised the capabilities of the trainees being trained within the ranger division. This equipment makes a vast difference from having to improvise an aircraft to simulate training. The level of confidence has also grown exponentially in term of the application of air operations. Since starting the “Eye in the Sky” project, air operations, patrols and monitoring continue at a rate of knots. “Tactical operations” in the areas in and around the College, support the work being done on the ground. As with the division, the Bathawk continue to evolve and are now equipped with modern technology including state-of-the-art software programmes and digital radios to aid in ground-to-air communication with Field Rangers being properly deployed in the fight against rhino poaching. The call for the establishment of the SAWC’s K-9 Unit was primarily due to the successes that dogs and their trackers were experiencing in the anti-poaching field and will support the Kruger National Park and other entities involved in and requiring canine capabilities. 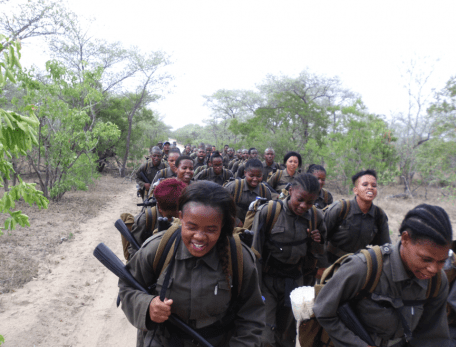 The addition of the Unit to the SAWC’S African Field Ranger Training Services division explicitly talks to the building and protection of rhino populations through field conservation efforts. Run as a College project, the full scope of the project aims to train field rangers (as dog handlers) and dogs in disciplines that are of most benefit to the anti-poaching community. 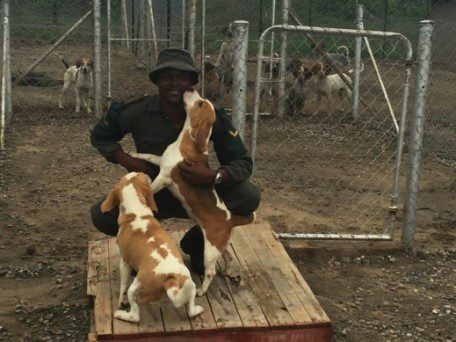 The initial focus of the Project is on rangers (handlers) and dogs in the disciplines that are not currently being offered elsewhere and will provide the greatest immediate benefit to the anti-poaching operations, whilst also directly building on the current K9 capability of the Kruger National Park. This in turn supports the five tactical areas that have been identified as priorities by WWF-SA to support rhino conservation efforts: Building resilient rhino populations through field conservation efforts, engaging local communities in wildlife conservation, strengthening national law enforcement activities, developing bilateral cooperation between South Africa and transit and consumer countries and ultimately reducing demand for illicit rhino horn. Bolstering this is the College’s provision of well-trained and equipped rangers, delivered through the new ranger training station, as well as aerial surveillance to help plot and monitor rhino movements and poacher suppression tactics and, during an operation, carry out poacher suppression tactics. Given the high levels of poaching pressure being experienced in the Greater Kruger area, which includes the Kempiana property on which the SAWC is based, and which is owned by WWF South Africa, it is envisaged that through the provision of effectively trained handlers and dogs, that poaching statistics will decrease substantially, and arrests will increase in this high impact zone. This will largely be due to the ability of the dogs to track at speeds much faster than people, and in terrain where the best human trackers would lose spoor. The project currently includes Free Tracking Dogs: Trained to locate, track and indicate the presence of fleeing poachers off line, free running as well as the incursion Dogs (Spoor Cutters): Trained to locate and indicate the crossing of borders and roads by poachers. 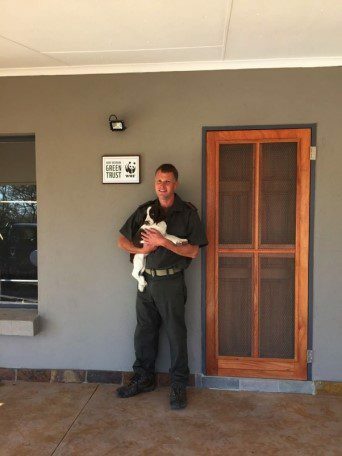 Funding provided by the WWF Nedbank Green Trust has helped support the establishment of dog handler and dog master accommodation on site, the development of accredited training material for free-tracking hounds and the 18-months of training required by the tracker dogs and their handlers.